1. Job Security and “Just Cause”. Verizon Wireless Retail Workers in Brooklyn now have much greater job security protection because the Company has agreed to a “just cause” standard for issuing discipline. . This means that workers at CWA-represented stores cannot be arbitrarily fired or disciplined. The “at-will” status no longer applies. The company must have a good reason—a clear violation of company procedures, chronic absence or lateness—in other words, “just cause”—in order to discipline anyone. The “just-cause” provision is also coupled with the grievance and arbitration procedure, listed below, to ensure fair treatment of workers. 2. Job Security and Limits on Contracting Out. The new Verizon Wireless contract also protects workers’ job security by restricting the company’s use of contractors. The company may not use contractors in Brooklyn or Everett if they lead to layoffs, part-timing of jobs, or downgrading of jobs. 3. Grievance Procedure. Workers are protected because all unfair actions of the company are subject to a two-step grievance procedure. This gives workers the right to file a formal charge against the company if the union and the worker believe management has violated the contract. So, in the event the union believes a worker has been disciplined or fired without “just cause,” a grievance can be filed. The first step of the grievance procedure will be a meeting between a supervisor and a union shop steward; the second step of the grievance procedure will be a meeting between a higher level manager and a representative from the Local Union. 4. Arbitration. In the event that an issue is not satisfactorily resolved during the grievance process, the Union can bring the issue before an independent judge, known as an arbitrator, who will conduct a hearing in which the worker has union staff or legal representation, to determine if the company acted in accordance with the contract. The arbitrator will make a binding decision to resolve the situation. Again, third-party arbitration limits the company’s arbitrary treatment of workers. 5. At Risk “Performance” Pay Converted To Guaranteed Pay. At present, a part of workers earnings depend on the attainment of certain performance measurements. These measurements are often arbitrarily determined or tied to criteria outside of the workers control. Payment of these current “performance” earnings are delayed and paid on a quarterly or annual basis. Under this agreement, $2,000 of “performance” pay in Brooklyn and Everett will no longer be at risk, but guaranteed. Solutions Specialists will have the CEI target moved to guaranteed base pay. Experience and Operations Specialists will have $2,000 of the 2017 STI immediately applied to guaranteed base pay. Unlike CEI & STI earnings, base pay earnings are enhanced by the compounding effect of overtime and differentials. This compounding results in hundreds of dollars of additional pay. Being reallocated to base pay also removes the uncertainty of the objective setting process. 6. Schedule Swaps. Qualified workers in like titles will have the right to swap schedules. Written notice must be sent to store management at least twenty-four hours in advance and it cannot result in any cost to the Company. Probationary workers and those on written discipline are not allowed to participate. 7. Union Status Protection. Workers are protected from being discriminated against due to their Union status. The Company cannot make any changes to the following items unless the same changes are applied to similarly situated employees in the entire North East Market: Health & Welfare Benefits, Retirement Benefits, Compensation Plans, Vacations, Holidays & Personal Days, Severance Plan, Job Performance Plan, and Policies, Practices & Procedures. 8. Union Representation. At any meeting with management in which discipline is to be announced a Union Representative can be present. 9. Admission To Premises. Union Representatives will be allowed access to all of the store locations to meet with members and management. 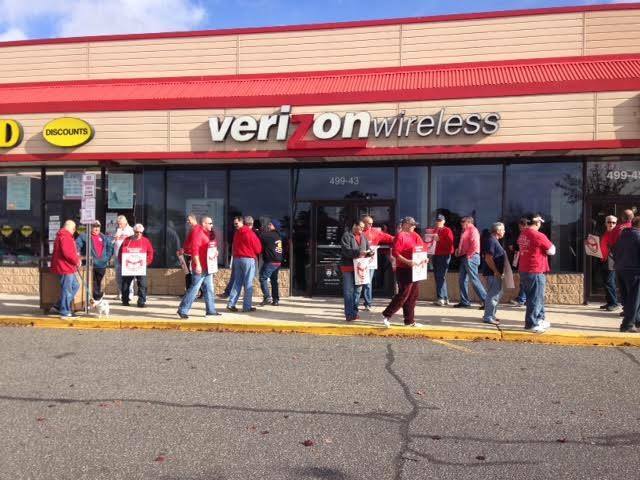 These Union Representatives include Verizon or Verizon Wireless employees as well as people from the Local and National Unions. 10. Collective Bargaining Participation. During the bargaining process for the next Collective Bargaining Agreement, two workers will be released from work and paid by the Company to participate in the process. 11. Transfer Protection. If the Company needs to transfer a worker outside of the Brooklyn or Everett bargaining unit, the worker will still be covered under the terms and conditions of this agreement. The Company is restricted as to how long a worker can be transferred. A temporary transfer will last no longer than thirty consecutive calendar days and an intermittent transfer will be no more than fifteen days in a thirty calendar day period. 12. Union Bulletin Boards. All store locations will have a bulletin board set aside for the exclusive use of the Union. Only authorized representatives of the Union will be allowed to post materials. 13. Transition Issues. Soon after the ratification of this agreement, workers will transition to programs that were implemented for other employees in the North East Market while negotiations were on going. Included in this transition is a new Performance Plan that no longer considers balanced score card results. Workers in Brooklyn will convert to a new Attendance Plan. This plan has an Emergency Short Notice process. This process allows workers to use up to sixteen accrued vacation and personal hours without prior scheduling or approval. The worker is not required to provide—and should not be asked for—a reason for the unscheduled absence. These hours can be used in four hour increments. 14. Duration of Contract. The terms of the contract will become effective upon ratification and remain in effect until 11:59pm on August 3, 2019. This expiration date is the same for all Union Represented Verizon Wireless workers as well as those in the Verizon landline side of the business. 1. The terms of this Return to Work Agreement ("Agreement") shall apply to all employees covered by the New York Regional Network CBA that expired on August 1 , 2015 at 11:59 between the CWA and the Company as well as to employees in the Brooklyn and Everett retail bargaining units. 2. Employees whose shifts begin Tuesday night, May 31, 2016 and extend into Wednesday, June 1, 2016 will report to work for those shifts. All other employees will return to work for their shifts that are scheduled to begin on Wednesday, June 1, 2016. (In either case the “Return to Work Date”). In unusual circumstances, the Company will excuse employees, without pay, from reporting for a reasonable period not to exceed 72 hours from 5 p.m. May 31, 2016. Returning employees will return to work on the same shifts to which they were assigned immediately prior to April 13, 2016. 3. Employees on approved leaves of absence, approved medical leaves, suspensions or scheduled vacations shall report to work following the expiration of such leaves, suspensions or vacations. 4. No employee shall lose service credit or life insurance as a result of participating in the strike. 5. The parties agree to execute the attached agreement relating to the CWA’s withdrawal of unfair labor practices charges related to the strike or collective bargaining and the Company’s withdrawal of injunction-related litigation and agree not to file any new or additional charges with regard to conduct occurring prior to the ratification date relating to the strike or collective bargaining..
6. Following the execution of this Agreement and the public announcement of this Return to Work Agreement by the parties, the Union shall notify all employees it represents that the strike has been terminated, and shall immediately withdraw all pickets and advise employees to return to work pursuant to the terms of this Agreement. 7. The effective date of this agreement shall be _______, 2016. Click here to download the Return to Work Agreement. Click here to download the Bargaining Summary.